A Tasty Mess: Husband Takes Over! My husband is an excellent cook. Unfortunately, he doesn't often have the time to invade our kitchen and work up a delicious dish. Thankfully, he was able to this week! He recreated one of my absolute favorite dishes from our honeymoon. 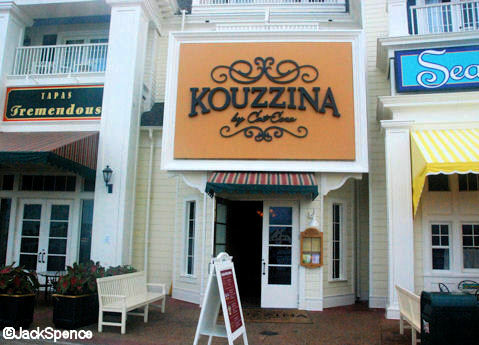 When we were at Disney on our honeymoon, we visited Iron Chef Cat Cora's restaurant, where I had the most delicious breakfast I have ever eaten! The stacked breakfast at Kouzzina is i-n-c-r-e-d-i-b-l-e. I am drooling on the keyboard just thinking about it right now...and contemplating buying a ticket to Orlando just so I can eat it again! What's in the stacked breakfast? 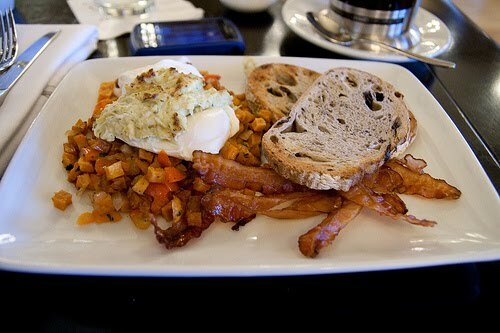 First there is this incredible sweet potato hash topped with poached eggs. The crown of the breakfast is this delicious, buttery artichoke spread and you pile some of the hash, the egg and the spread on the olive bread and gobble it down as fast as you can...savoring every bite of course. I honestly was sad when I finished this meal, because it was over and we had to leave for the airport...sigh. So Aaron (my husband) didn't exactly recreate the entire breakfast, but he hit it out of the park with this incredible Sweet Potato Hash...might actually have had better flavor than Cat's! We didn't go as far as making the artichoke spread or the olive bread - next time we'll try that for sure! *I didn't list measurements for the spices because Aaron doesn't really measure when he cooks...this is probably why he doesn't bake! 2. Add in the sweet potatoes and cook for about 20 minutes, stirring and adding more spices to taste as the veggies all cook down together. Continue to turn the sweet potatoes well so they all get browned and semi-caramelized. 3. You're done! Just serve it up and enjoy...gloat about how awesome your mad cooking skills are...top with eggs. Any type would be good, but we chose over-easy eggs and they were so yummy on top of the hash! Hope you guys try the recipe and let me know how you like our Iron Chef imitation honeymoon breakfast!